I have recently discovered a much less messy, less wasteful, and time saving method of gluing rhinestones on! I can’t believe I never thought of it before. What’s the secret? Syringes! It really is that simple! Click the link for a great video showing just how to use the syringes most effectively! Using a syringe with a 14 gauge tip (or so), and E-6000 glue, I was able to complete 3 costumes (2 were partially started), in addition to a few other projects in about 4 1/2 hours. Using my old method, or other methods I was previously aware of, I would have maybe finished 2 costumes in that amount of time, and that would be working non-stop. I did not have glue all over the place, and I didn’t have to throw away any paper or cardboard with dried globs of glue. Using the syringe method also seemed to reduce the fumes of the glue, since it was contained in the tube, not sitting out on a piece of paper on my work surface. Note: the syringes and tips are meant to be disposable. Eventually, glue will dry in the syringe, and you may need to toss it. That is why both the syringes and tips are sold in multi-packs. Start out with only a small amount of E-6000. It really goes a long way when you are using this method! Make sure the syringe is sideways when you are putting the glue in, then point it up to let most of the air out before putting the tip on. I did not take the tip off in between adding more glue. The important piece is to let the air out! When you pull back the plunger in between glue application steps, pull it back just enough that the glue stops oozing out. By pulling it back too far, you are allowing more glue to enter the syringe, which will dry your glue out faster. If you are going to let your syringe sit for an extended period of time, pull the syringe back just a tiny bit, and open up a paper clip to insert into the end of the tip. Again, the prevents air from drying out the glue. If your glue does end up drying inside your syringe, depending on the glue you use, you may be able to peel the glob of dried glue out, and use the opened paper clip to pry any remaining glue out of the tip. I can’t say for other glues, but this did work with E-6000. 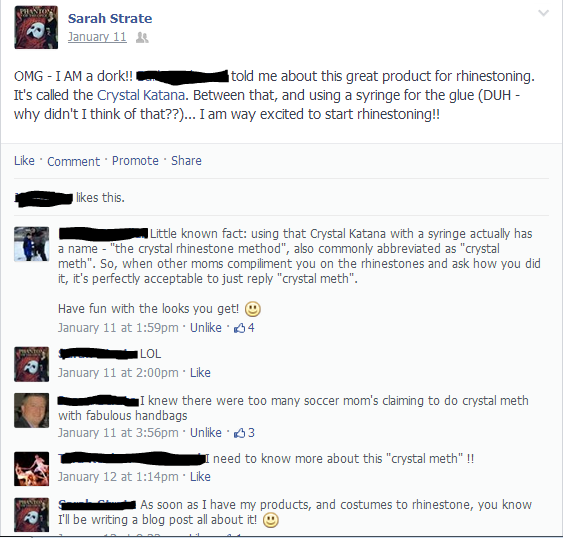 One of the dance moms discovered a tool, called the Crystal Katana, at Crystal Couture (I ordered mine online). It has some similarities to the wax positioners I have used in the past. The main differences are that the handle is bigger, the wax is more sturdy, and thus, it will last much longer. The opposite end of the wax has a hole just the size of the tops of the rhinestones, so it is more effective for pushing stones down, or positioning them as needed. 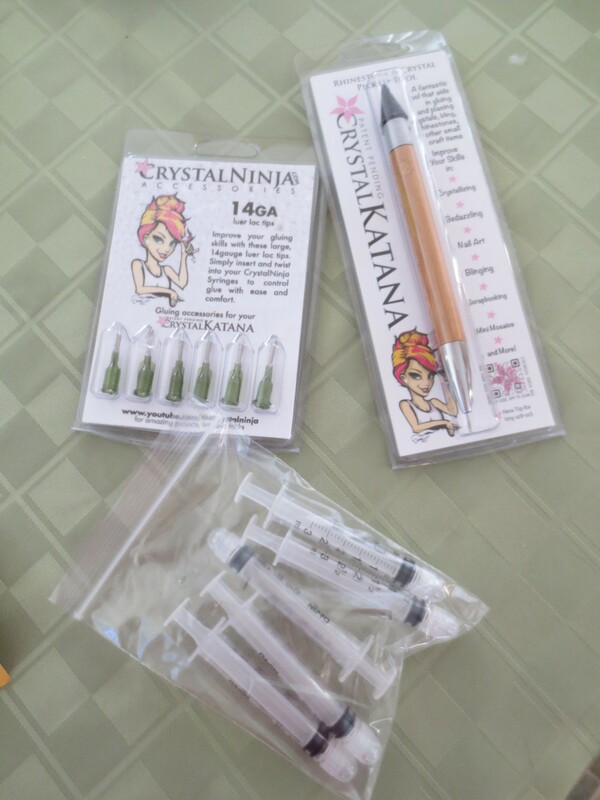 While working on costumes yesterday, I used both the Crystal Katana, and the wax positioners. They were fairly equal in their ability to pick up the stones to place them on the tiny dots of glue the syringe made. With the Katana, it really took no pressure at all to pick up the stones. I liked that. On the rare occasion that I pressed too hard, a little wax residue was left on the rhinestone (which wiped right off), but no more than I would have gotten with the regular wax positioners. I liked having both tools handy, because the “other end” of the wax positioner helped scrape away any glue that oozed out from under the rhinestones. I thought the Crystal Katana was very easy to use. I liked the wider handle, and how little pressure it took to pick up the stones. It didn’t dent the wax, as has happened to me on the regular wax positioners. Some of the staff at the dance studio did not like using the Katana. They thought the handle was too wide, and was uncomfortable. Previous 6 Lessons Learned Spending the Day at the Dance Studio Next I Took The Plunge!